These images appeared recently relating to a project in Los Angeles, related to the restoration of water reservoir levels of bromate. A past post outlined similar situations in Silver and Elysian Lakes and the use of phytoremediation to eliminate levels. 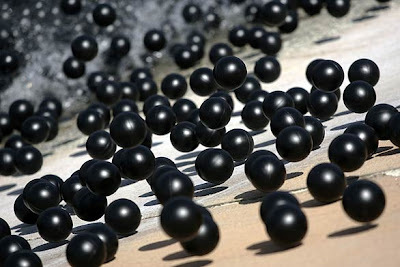 A new approach is the use of sun-block, in the form of plastic balls, that limit the mixing of bromide and chlorine which is causing elevated levels of bromate. 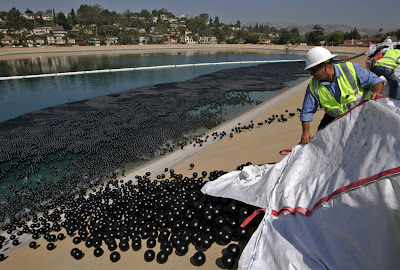 A summary from a post in Boston.com: "Department of Water and Power workers are emptying out bales of plastic balls in the Ivanhoe reservoir in Los Angeles on Monday, June 9, 2008. 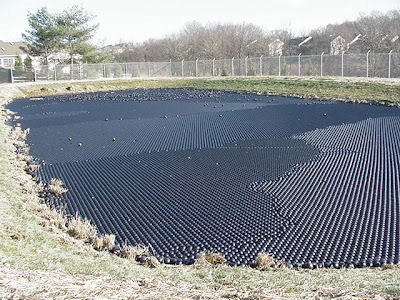 Department of Water and Power released about 400,000 black plastic 4-inch balls as the first installment of approximately 3 million to form a floating cover over 7 acres of the reservoir to protect the water from sunlight. When sunlight mixes with the bromide and chlorine in Ivanhoe's water, the carcinogen bromate can form." From the LA Times: "Open reservoirs exposed to sunlight are now rare. The area's reservoirs -- Silver Lake, Ivanhoe and Elysian -- first registered elevated levels of bromate between June and October 2007. But state health officials said the dangers were minimal because bromate poses a small cancer risk only after consumed daily over a lifetime.But the discovery of bromate prompted officials to look for ways of shading Elysian and Ivanhoe. A tarp would have been too expensive and a metal cover would take too long to install, especially in a year of drought. 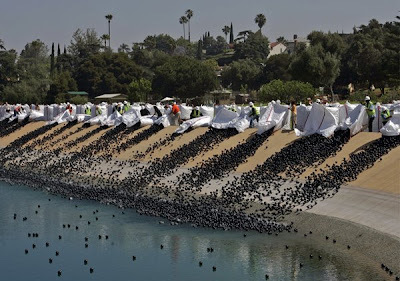 So one of the DWP's biologists, Brian White, suggested "bird balls," commonly used by airports to prevent birds from congregating in wet areas alongside runways.Ivanhoe and Elysian reservoirs will be blanketed by about 3 million balls each for about four years." It would be interesting to see if this could be a pre-emptive method of reducing bromate production, or other potential toxic issues. Aside from the more common use of airport protection, this extreme (yet simple) method could have some additional uses in sunlight-driven water pollution, including algal blooms which deplete the waterways of oxygen, resulting in eutrophication. Also, it could be used to cool water temperatures to improve fish habitat. Some other options I found would be heat retention, odor control, evaporation control, and vapor containment. Obviously there are implications to life forms - including what would happen as plastic breaks down (read: drinking nurdles) and impacts on other ecological systems. Not that a technological fix to a technological cause is the best medicine, but an option that seems low-tech and viable. Again - it's something in nature that ecosystems often do themselves... through vegetative shading... black balls not required. I'm guessing this will actually aid in preventing evaporation, even with the black color of the balls. Exposed water bodies lose significant amounts of water, the research on 'bird balls' seems to suggest there's evaporation reduction potential, as well as some insulation value (i.e. cool water stays cooler - hot water stays hotter). Perhaps a method for open water reservoirs - just for the water conservation. Or maybe a lighter color would work better? I saw your blog on the LADWP effort to control bromate with Bird Balls. They are trying to limit sunlight getting to the water to control formation of bromate from bromite. I am not quite clear that this will work. The water from the Ivanhoe Res. is treated, potable water. It simply decants over a spillway to the uncovered Silverlake Res. You speculate that these balls "could have some additional uses in sunlight-driven water pollution, including algal blooms which deplete the waterways of oxygen, resulting in eutrophication. I would suggest that you may wish to reconsider this view. Eutrophication means that the water is nutrient-rich, typically a lot of nitrogen/ammonia, from runoff of fertilizers into waterways. The algae do not create the eutrophication, they simply use it as a food source. Algae (phytoplankton) are the first step in the food chain. Using photosynthesis and nutrients, algae grow and prosper. Blue-green algae, generally pretty nasty, are the main source of harmful algal blooms (HAB). So to be succinct, sunlight doesn't pollute or drive water pollution, the cause of eutrophication is excess nutrients, and the algae blooms result when given a lot of nutrients and sunlight. Blue-green algae, which have been around for over 2.5 billion years, have, like many things in botany, developed defense mechanisms to prevent them from being eaten by zooplankton. More specifically, particularly toxic substances such as microcystin and saxatoxin, to name several of about 80. BTW these are also highly toxic to fish and mammals, including humans. Blue-green, a.k.a. cyanobacteria, have also developed means to dominate the water column in the competition for sunlight over the green algae. Green algae are generally good, providing the main food source for zooplankton, which in turn are eaten by fish. When blue-greens bloom, they produce lots of toxins, and taste and odor problems in water supplies. When they die off after a bloom (when the nutrients have been used up) they sink to the bottom and decay. The decay process takes up lots of oxygen, making the water anoxic and not suitable for living things, like fish, which either leave or die. I would say that limiting the sunlight to open bodies of stagnant water (ponds, lakes, reservoirs, estuaries, oceans) won't solve the eutrophication problem. With or without sunlight, there will be eutrophication. Limiting sunlight would limit algal growth. However, other, anaerobic bacteria are waiting to kick into gear in such nutrient-rich conditions. Then you get H2S and methane production, as well as out-gassing of CO2. Given that Ivanhoe is a potable water storage facility, it will likely have chloraminated water, 5 parts chlorine, 1 part ammonia. In dark conditions, ammonia oxidizing bacteria (AOB), will convert the free ammonia to nitrite, then nitrobacter will convert nitrite to nitrate. Both of these chemicals are regulated in drinking water.